I could not bring myself to call this sauerkraut, despite a long association between Turkey and Germany and the resemblance of the result. The first time I went to Turkey, I took a plane that originated in Munich and stopped in Vienna, where I boarded it. It was full of Turkish men who had been working in Germany and were returning home. The entire time I was in Turkey, I was assumed to be German (which comports with my heritage so that was logical). The association of the two countries is still vivid for me. 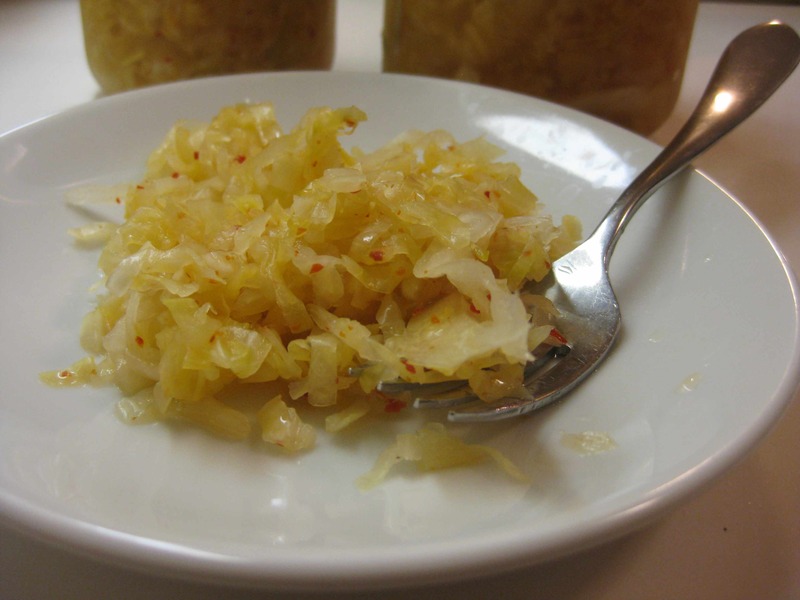 This recipe from Linda Ziedrich’s Joy of Pickling, brought to my attention by blogger Tigress in a Pickle, combines two beloved ingredients: pickled cabbage and dark Aleppo pepper. I know, Aleppo is technically in Syria today, but this particular condiment is shared by Syrian and Turkish cuisines. It used to be hard to obtain but even Williams Sonoma carries it now, though theirs is much less intense than the preferable versions from Kalustyan’s in New York or Savory Spice Shop. Ziedrich’s version simply calls for red pepper flakes; it was Tigress who suggested this type of pepper. A good alternative would be Korean red pepper paste, since the recipe’s methodology is more like kimchi than sauerkraut. November is my month for fermenting cabbage. Not only because of the abundance of beautiful heads of just-harvested heads but also because I need to clear my refrigerator for Thanksgiving. I was amused by the New York Times’ Melissa Clark’s recent advice in the run-up to turkey day: clear the condiments from your fridge since the vinegar and sugar will allow them to survive a few days on the counter. With an overload of vegetable matter for a couple of weeks, in mid-November, I have every cooling triage strategy in mind. The great outdoors? The office refrigerator? However, using this time period to ferment cabbage solves a problem of time and space and prepares us for the winter pantry. Mix the cabbage and 2 tbsp of the salt in a large bowl and let sit for 2-3 hours. Drain the cabbage and rinse it in cold water. Mix the cabbage with the garlic, ginger, pepper and sugar and pack it in a 2-quart jar. Dissolve the remaining 2 tbsp salt in 3 cups of water and pour enough of the brine over the cabbage just to cover it. Push a food-grade plastic bag into the jar, fill it with the remaining brine, and tie it. This is intended to weigh down the cabbage. Other methods would also work; for example, I use plastic wrap and a flexible silicone disk (potholder) wedged into the jar. Cover the jar with a tea towel secured with a rubber band. Place the jar out of direct sunlight in a location where the temperature is between 65 and 72 degrees. Stir the mixture every day (which is why I prefer the silicone disk). The fermentation will slow after 10-14 days, at which time the cabbage is ready to eat. Store, tightly capped, in the refrigerator. This will keep for a couple of months.